Red and black Power Plank Ab Cruncher by Super Smart Shopping, also known as the “5 Minute Shaper” is the effective new device to help you get flat abs and even six pack in a month by just five minutes a day as it combines the reverse crunch with the most natural yoga strengthening pose- plank position of Far East, also combining cardiovascular exercise and toning which is great for the core, back, upper body and even legs and buttocks / buns as well. It will also help with fat burning and weight loss but the main purpose should be toning and strengthening your core and other parts of your body so yes it will look like you have lost weight with a tighter body. 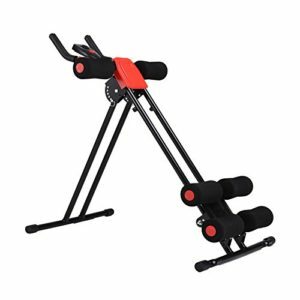 It is suitable for both women and men of different age groups and can carry a maximum user weight of up to 255 pounds on its solid steel frame and weighs just 21 pounds, and with its foldable design becomes compact and easy to store anywhere in your house- in your closet, under the bed or in a convenient corner. Although this is designed as an ab cruncher that uses reverse crunches to help tighten, strengthen and build your core muscles with a very special yoga pose used for thousands of years in Asia, it is actually for the whole body as a versatile unit with multiple functions with different angle resistance adjustments to help you for push-ups and torso roller as well and you can choose from four levels of different angles of beginner, intermediate, advanced or expert levels depending on your level of fitness. Power Plank is easy to assemble in no time with the instructions provided and is easy to use as it moves smoothly on its sturdy frame- you can start straight away once set up. It has an LCD display that shows you the calories burned, time / duration, distance and count / repetition to help you track your workout progress. Maximum incline is 45 degrees and will help you burn fat and shape your lower body, core and upper body, so it is not just abs. It may feel a little hard to do at first but it is good to be able to adjust the level of difficulty and you’ll get used to it quickly and start seeing results in a few weeks. Please note that the results you get and how quickly will depend on your age, if you’re regularly using this machine and how healthy you eat. Knee rests are curved and padded for your comfort and to help you exercise for longer. We recommend that you use this machine ten minutes a day to get better and quicker results (which you can as it is also fun to use) and if it is too much for you at first, you can increase it gradually to how much you can handle- you will feel the burn and your abs will probably be sore after your first session. Unlike with some other ab workout units, your lower core feels the tension the moment you start moving up the Power Plank so there is no break in between and this makes it more efficient and it is great to have to freedom to vary the angles. You can also twist from one side to the other when you’re sliding up the Power Plank and this will certainly give you that a little bit of extra and without any pressure on your spine or your neck. 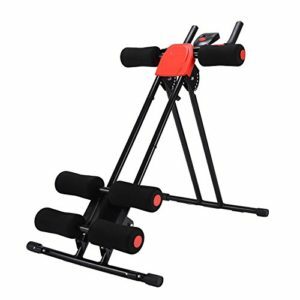 It is definitely one of the better ab workout machines with quite a bit of versatility to work your whole body and we think it is good value for money.